Hope springs eternal according to the 18th-century English poet Alexander Pope and gold bugs. Gold bugs believe that the yellow metal provides protection against inflation, devaluation of currencies by central banks and general market downturns. To a gold bug, it’s always time to buy gold. But, other market participants view gold as a short term investment tips / instrument rather than a longer term buy and hold investment. They believe gold prices fluctuate based on factors including supply and demand and sentiment. Supply and demand and sentiment are important factors in many markets, including stocks and other commodities. Technical analysts assess these factors with price charts, and the price chart of gold that is shown below has caught the attention of many technical analysts. Gold appears to be nearing an up side breakout in the chart, completing a pattern many technical analysts believe to be bullish. There is a blue rectangle highlighted in the chart. A rectangle pattern develops when prices move within a relatively narrow range. This is a period when supply and demand are believed to be relatively in balance. A breakout from the rectangle is expected to be the beginning of a new trend. The chart also shows a trend line connecting lows that have developed over the past 18 months. This shows buyers are entering the market as bottoms form. The higher lows show that buyers appear to be more anxious to enter positions. These patterns point to potentially higher prices in gold. However, if a down move occurs instead, buyers who bought in anticipation of an up move could become sellers. The combination of factors on the chart tells us a rapid move in the price of gold is likely to develop soon. To learn more about the market, we can look at who is buying at this level. There are many differences between futures and stocks but one of the benefits of futures is the accessibility of information about what other traders are doing. This level of detail is not available in the stock market trading. Raw CFTC data can be difficult to interpret. The report itself is a collection of numbers provided in text format by the regulator. Because the report can be difficult to interpret, some data services convert the data into an index. In gold, individuals are becoming bearish as large traders and commercials seem to be near neutral levels. This indicates a large price move could draw in these groups of traders. A large price move in gold appears likely. However, there is no way to forecast the direction of that price move. 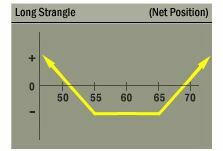 The long strangle involves buying an out of the money call option and an out of the money put option, both with the same expiration date. This strategy can be used when a significant move in a stock is expected. This strategy can benefit a large move, without requiring the trader to form an opinion on the direction of the trade. To trade gold, we can use options on SPDR Gold Shares (NYSE: GLD). GLD is trading near $128 a share. An out of the money call is one that has an exercise price above the current price of the stock. An out of the money put is one that has an exercise price below the current price of the stock. For GLD, a strangle can be created by buying an $128 call and an `$128 put, both expiring on March 16, the day after earnings are announced. The call is trading at about $2.00 and the put is trading at about $1.75. To open the trade, a total of $375 will be required since each contract covers 100 shares. This example ignores commissions because they should be quite small, just a few dollars, at a deep discount broker. When trading options, it will be important to select a broker that offers very low commission rates. Assuming GLD moves by 3% or more in the next month, this trade will be profitable. If GLD moves 5%, for example, the trade would deliver a gain of about 70%. A 5% move would be equal to about $6.40. If it is up, the call would be worth about $6.40 and the put would be worthless. If it’s a down move, the put would be worth $6.40 and the call would be worthless. Either way, the gain is about 70% of the amount invested. This return would be for a short term trade. If trades like this could be found once a month during earnings season, the potential gains on the amount of capital required to open a trade would be rather large over the course of a year. The risk of the trade is limited to the amount of money paid to purchase the two options. Even if GLD fails to make a large move, the size of the loss could be smaller than the amount invested assuming one of the options retains some value.